Hydraulic & Manual Dock Equipment - Golden State Door Co. The Blue Giant Xtra Dock Safety (XDS) series is the industry's first interlocked dock safety combination. 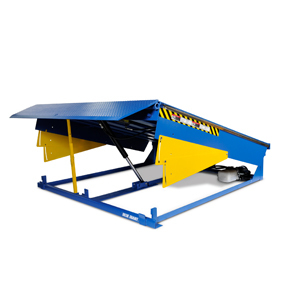 The heavy-duty hydraulic dock leveler supports extended-usage applications, and the Door and Dock Guard (DDG) acts as a safety barrier to prevent forklift roll-off and overhead door damage. The U-Series Air Cylinder Dock Leveler (patent pending) from Blue Giant is technologically innovative and an industry first. This groundbreaking new dock product uses the power of air to deliver the same optimum performance that makes Blue Giant dock levelers an industry standard. 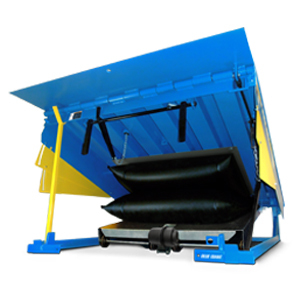 The Blue Giant U-Series airbag dock leveler (patent pending) combines our advanced, environmentally friendly air lifting system with the durable structural design that’s made us a global leader in the design, manufacture, and distribution of loading dock systems. Strength is the hallmark of Blue Giant. We deliver one of the highest strength ratios in the industry with features like high tensile steel. We incorporate a minimum of 6 I-Beam deck supports in all A-Series Dock Levelers. At higher capacities that increases to 8 I-Beams. I-Beams offer greater strength support. 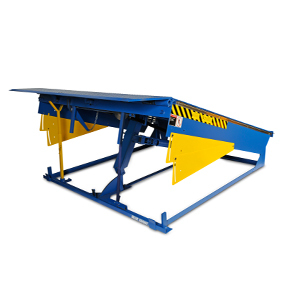 U-Series hydraulic dock leveler an ideal choice for increased productivity at the loading dock. 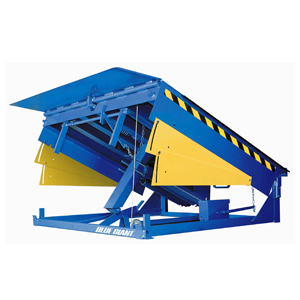 is a heavy-duty workhorse that can meet the challenges of the busiest loading docks. The I-Beam mechanical dock leveler has an innovative design that enables it to tilt up to 4" (102mm) on either side when under load, allowing full width contact between the lip and truck bed. 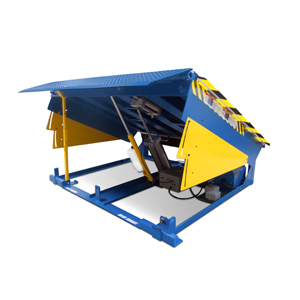 This unique feature, Assured Motion Float, prevents damage to forks, tires, steering system and load, thereby prolonging the working life of the dock leveler and improving cost of ownership. The “H” Series is structurally designed for the most demanding applications with easy push button convenience for smooth, consistent operation plus outstanding toughness and dependability in your most challenging dock operations. McGuire offers a hydraulic dock leveler to meet any of your dock equipment needs while providing low lifetime ownership costs and years of trouble free service with the industry’s best built-in safety. They are most often mounted in a pre-formed pit at the dock commonly used to reduce the grade between the dock floor and the trailer bed. Various sizes and capacities allow for a large amount of flexibility. Hydraulic levelers have added safety features and save time in operation and maintenance. They come in 6’, 6’6” & 7’ standard widths and 6’, 8’ & 10’ standard lengths with 12’ and other lengths available. Standard capacities for the “H” Series are 45K, 55K, 75K and 100K CIR (Comparative Industry Rating).